Welcome to Helmut Hampton Digital Marketing. 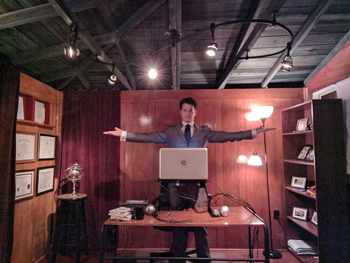 I’m Helmut Hampton, and our company is the #1 digital marketing agency in Citrus Park, Keystone, and Westchase, according to Google and our clients. We’re different from other digital marketing companies because we actually get businesses found in Google. And, we don’t just say it, we prove it with our rankings and client references. Also, have a look at our testimonials page. If you own a local business in Citrus Park then you have probably realized that not being on page one of Google means you are losing money to your competitors every day. Being on page 2 and beyond means that nobody is going to see it. People rarely go beyond the first page of Google. In fact, the vast majority of people click on the first or second results of their search. Because of this, you can see that if your website is not on page 1 for your business’ keywords then you are sacrificing revenue to your competition. However, this is something we can help with. 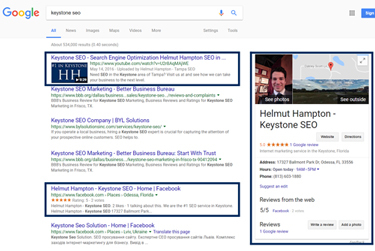 We’ve ranked businesses for hundreds of keywords for ourselves and our clients getting thousands of visitors from Google every single month. All businesses can benefit from an increase in traffic. However, we have certain criteria that must be met to ensure we are a good fit. In short, we work with up-and-running businesses that have a proven business model and satisfied customers. We do not work with startups, “get-rich-quick” schemes, or adult themed businesses. When you have good SEO done to your website, you are going to get more traffic. But, whether a business is prepared to take on those new customers and service them is up to the performance of that business. This is why we make sure that we are a good fit for all the businesses we work with. We want our clients to see drastic effects from our services, not just minor, unnoticeable differences in revenue. Therefore, we make sure that the businesses that we work with already have satisfied customers and are able to scale their business. Without a track record of at least some success, we can’t be reasonably certain that more traffic will help increase revenue. If your business, however, does have some success and you just need more traffic, then we want to help you. A well-run business with satisfied customers that then adds traffic from Google is the perfect recipe for local business success. 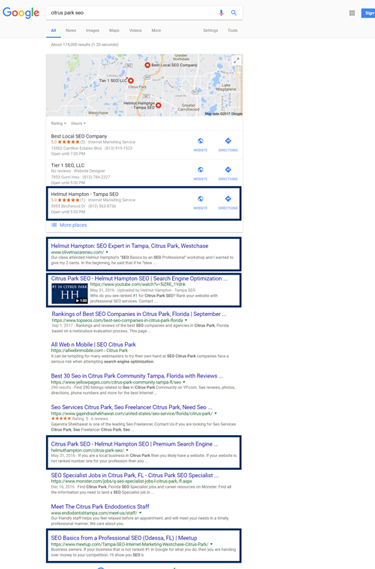 Since you’ve found our website, you are likely the owner or manager of a local business in Citrus Park and would like to expand by getting found in Google. Just like we dominate page 1 for Citrus Park SEO, we will get your Citrus Park business on page one for your keywords. 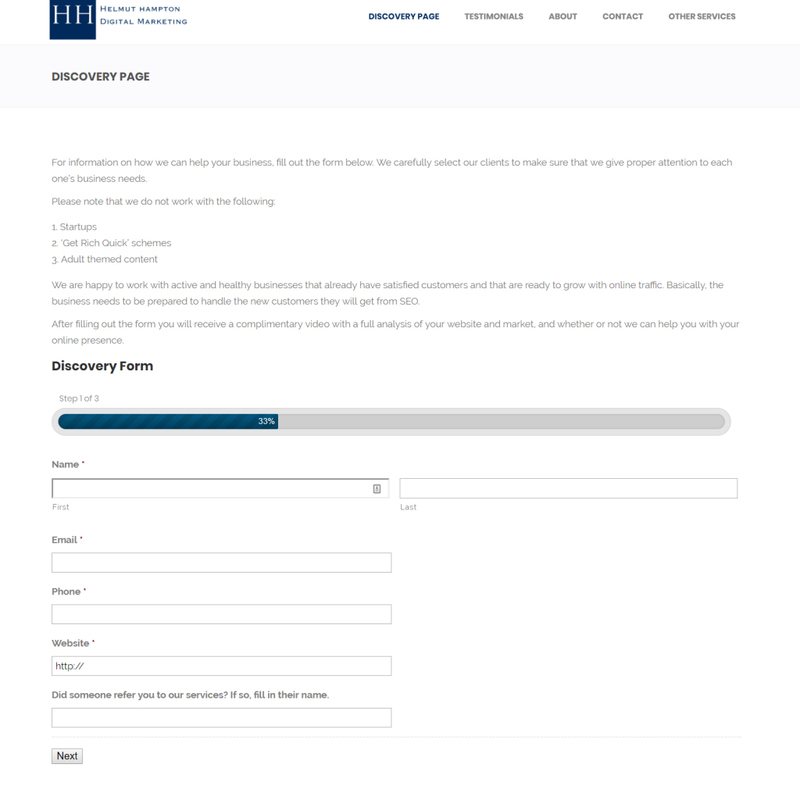 So, fill out the Discovery Form, and we will make a complimentary custom video for you showing a full SEO analysis of your website. You will get more information about your market, competition, and website than you have ever had before. 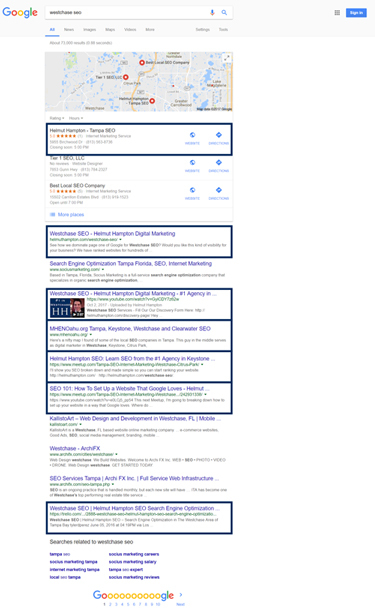 And, we will show you exactly where you currently stand in Google’s eyes and what we can do for you.